In southern Afghanistan Monday gunmen riding a motorbike shot dead a doctor who worked for the United Nations Assistance Mission. No one has claimed responsibility for shooting Tourpakai Olfat in Kandahar. She had worked for the U.N. for the past 12 years. A UNAMA spokesman, Dominic Medley, said the agency is angered by the assassination of its staff member. The southern Afghan region is considered a Taliban heartland. The recent upturn in insurgent attacks across the country has led the U.N. to relocate its local and expatriate staff from several offices to relatively safer areas in Afghanistan. The assassination of the doctor came two days after the U.S. embassy in Kabul warned of attacks against the U.N. headquarters or possibly its offices in the Afghan capital on or about October 12. Meanwhile, the Taliban says it has added Afghanistan's largest private television station, Tolo, and another broadcaster, 1TV, to the insurgent group's list of legitimate targets, condemning both stations as American propaganda tools. The militant group said in a statement it no longer recognizes the two channels "as media outlets but designates them as military objectives due to their disrespectful and hostile actions towards the Afghan Mujahid nation. Henceforth no employee, anchor, office, news team and reporter of these TV channels holds any immunity." Violence and threats against media outlets and journalists have spiked recently. On Sunday, a helicopter crash at a NATO base in Afghanistan's capital Sunday killed five coalition service members and injured five others. "The incident resulted in the death of two British servicemembers, two U.S. servicemembers, and one French contracted civilian," a NATO statement said. The helicopter crashed while landing in Kabul at the headquarters of the NATO Resolute Support Mission, which is training Afghan security forces. The British defense ministry statement said it could confirm that the crash "was an accident and not the result of insurgent activity." NATO says the incident is under investigation. 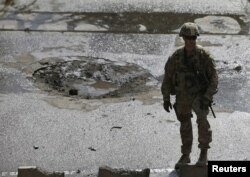 The accident happened just hours after a Taliban suicide car bomber struck a British forces convoy in Kabul. Officials said three civilians were wounded in the attack, but no fatalities were reported. Taliban spokesman Zabihullah Mujahid emailed a detailed statement about the attack to VOA. He said the suicide car bombing was carried out in response to air raids by foreign troops in different parts of Afghanistan, including Kunduz, which killed Afghan civilians, including doctors. He claimed that at least 12 people were killed in the bombing Sunday, though the militant group is known for exaggerating the death tolls in similar attacks.